I’m lucky. I’ve caught sufficiently few fish to remember the ones that mattered. The first was a 42-inch, northern pike caught on light spinning tackle for small-mouth bass. It was on a modest, sausage-shaped lake not far from Marten River. I was in a 14-foot, aluminum boat with a guide who was raised in Cambridge, Ont. before succumbing to the allure of Northern Ontario, and another angler, one of the dozen retired teachers with whom I spent a week at a fishing camp. I was so pumped after returning to camp that I drank a goodly portion of a twenty sixer of quality single malt. I shared the whisky with my fellow anglers. But the close friend who had invited me to the camp, the late Steve Leslie, went to bed early, not realizing how an explosion of endorphins elevates a taste for whisky. The second memorable fish was a native brook trout caught on the Rocky Saugeen. It wasn’t the first fish I caught casting fur and feather, but it was the first not raised on hatchery food pellets. The third was a good-sized bass caught from a canoe on a lake in Muskoka with my fly fishing buddy Dan Kennaley. What made the fish special was it was caught with a black woolly bugger sporting a long red tail which I had tied while supervised by Dan. The fly was one of only three, including two woolly worms with short red tails, I have ever tied. The fourth fish was actually a trio of small brown trout (known as dinks) caught on the Conestogo River. It was the first time I ever used a bamboo fly rod. In this case, a leisurely Goodwin Granger, circa 1940. The fifth fish were actually eight small rainbows caught on the Rocky Saugeen with a 7-foot, nine-inch bamboo rod built by an unnamed artisan. The sixth fish followed a month later and was actually a combo of 21 brookies, bows and browns caught on the Beatty Saugeen with the same fly rod. It might well have been the most trout I ever caught during a single outing. The seventh and most recent memorable fish — which has yet to be caught — has a back story. In the spring of 2015 I was ruminating with my partner Lois that, as a retirement gift to myself, I would like to order a Sweetgrass fly rod. I explained that Sweetgrass was founded in the small Montana town of Twin Bridges by legendary bamboo rod builder Glenn Brackett after he resigned from the venerable R.L. Winston Rod Company. When he was still a partner in Winston, Glenn relocated the bamboo operation to Twin Bridges from San Francisco to enjoy the better fishing. Jerry Kustich moved to Montana for the same reason and susequently hooked up with the Boo Boys. Jerry is one of my favourite fly angling writers. If you want to read what led to the establishment of Sweetgrass, and the philosophy of devoted craftsmanship that informs Sweetgrass, I recommend Gerry’s fine companion memoirs At the River’s Edge, A Wisp in the Wind and Around the Next Bend. When he describes his fellow Boo Boys you can’t help wanting to meet them and a hoisting a few pints at the nearest watering hole, not to mention spending an afternoon in their company on one of Montana’s hallowed trout rivers. Patagonia founder Yvon Chouinard’s business philosophy blurred the line between work and play fostering creativity, loyalty and a sense of belonging among his employees. This vision led to a content workplace and a business that has prospered over the years. Years ago the same belief was adopted by Tom Morgan and Glenn Brackett at Winston Rods. ‘This provides the artistic freedom and inspiration,’ according to Tom in a 1979 catalog, ‘to accomplish what we feel is outstanding work. . . .’ This credo has been ingrained into the Boo Boy tradition and will continue into the future. Each member of the Sweetgrass crew has led a diverse lifestyle outside the conventional norm where a successful life is defined by the quality of the pursuit. We have all taken the time to routinely do the important things in life like fish, hike, snowboard, talk to neighbors, go to community meetings and so much more. These activities vitally influence everything we do, especially the spirit behind the crafting of each individual rod. Quite simply, we believe in what we do and how we live and it shows in our work. Lois, a retired teacher, understood my desire to acknowledge my years of work. I got my first job at 15 years of age as a bell hop in a hotel and worked as a factory assembler, truck driver, construction labourer and shipper-receiver before landing my first newspaper job on the first of six newspapers I worked at across Ontario over four decades. Purchasing a Sweetgrass rod would be an extravagance in the sense that it would cost more than I have ever spent on any other single item, with the exception of cars, houses, vacations and orthodontics for my two sons. But I knew the rod would be worth every penny — and more. I explained this to Lois, with the caveat that it would likely take 18 months to receive the rod after placing an order. Such is Sweetgrass’ waiting list of eager clients. Moreover, when I first articulated this dream, I had no immediate prospects of retirement. In fact, I was anticipating working for at least another three years, taking me beyond the ’normal’ retirement at age 65 by a deuce. But fate had other plans. Thankfully. A couple of months later the newspaper for which I worked as an arts reporter for three decades offered a buyout too good to refuse. As well, my sons had graduated from university and college. Still, a split-cane Sweetgrass was a wild whim floating far off amidst distant galaxies. Or, as Will Shakespeare wisely observed, such stuff as dreams are made on. Unbeknownst to me, however, the stars were in alignment when I visited Grand River Troutfitters founder Ken Collins. I dropped by his home so he could load a vintage Orvis CFO reel I had purchased from him with Cortland 444 double-taper fly line. I wanted the five-weight line to use with my two bamboo rods. Before loading the reel, Ken went into an adjacent room, explaining that he had something he wanted to show me. I recognized the Sweetgrass insignia (a pair of trout holding in a yin-yang) on the lid of the tube before he opened it. He asked if I knew about Sweetgrass, to which I nodded — somewhat idiotically I’m sure. He pulled out the sleeve, revealing a gorgeous seven-foot/nine-inch, three-piece, five-weight. He assembled it and handed it over. I was gobsmacked. Imagine, I was actually holding a sweetly singing Sweetgrass in my very own, clumsy paws. Light, yet supple, with some snap, it was like an extension of my right arm. Words escaped me, which those who know me will find hard to believe. Before leaving, I confessed I couldn’t ignore this serendipity. I have been a reader of Carl Jung for 45 years and, if this wasn’t an instance of synchronicity, I don’t know what the great Swiss psychologist meant by the term he coined. Although Ken had been given the rod to sell on his website, he handed me a business card and told me to talk directly to the rod’s owner. It was an extremely generous thing to do. Thank you, Ken. 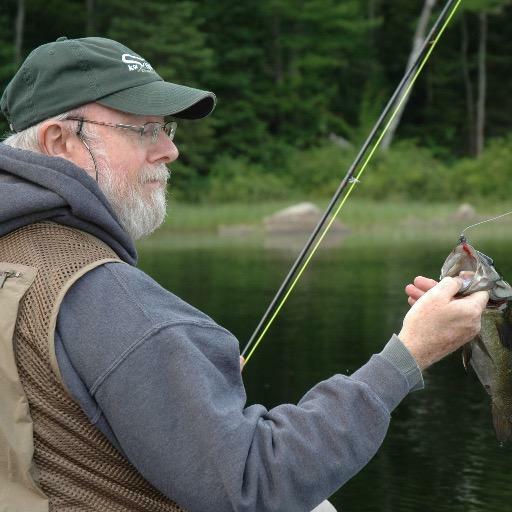 I called the owner a few days later, after returning from a lovely visit to the Muskoka cottage of my good fly fishing buddy Dan Kennaley and his wife Jan. As usual, Dan and I spent a wonderful afternoon in a canoe, casting fur and feather at large- and small-mouth bass on a nearby lake. 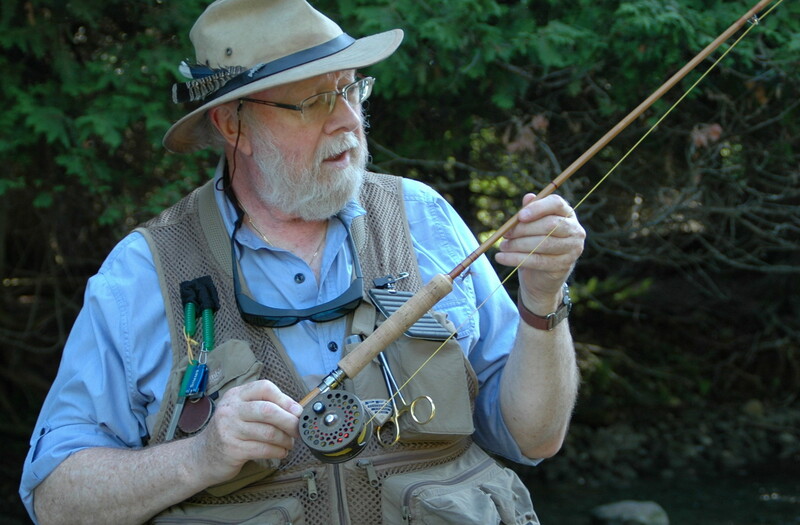 It was one of the few times I caught more fish than Dan, who has been fly fishing for more than a quarter century and is the fly fishing columnist for Ontario Out of Doors magazine. The rod’s owner, Bob Cove, knew a lot about Sweetgrass. He had met Jerry a couple of times at the Grand River bamboo rod builders gathering, known as Grand Gathering, and had even visited the Sweetgrass shop in Twin Bridges three years previously. It was the second custom-built rod he had purchased. He assured me Glenn had built the blank — a signature, hollow-fluted, hexagon classic from a modern master. I told Bob I wouldn’t haggle over price. It would be discourteous to him and disrespectful to Glenn, I asserted. Bob quoted a price, I accepted, knowing that with the retail price of Sweetgrass rods, the exchange rate, shipping costs and sundry taxes, it was a fair price for a priceless object made by craftsmen who carry forward the proud tradition of American hand-made bamboo fly rods. Bob said he was pleased the rod was going to someone who would appreciate it as a superb fishing instrument. The agreement was struck 10 days after my 64th birthday. I put a cheque in the mail, but Bob insisted the rod was mine to pick up as soon as I was able, confirming that there is still such a thing as a gentleman’s agreement between fly anglers. By now, you know my seventh memorable fish will be when I return to home waters waving my new Sweetgrass in pursuit of trout which American songwriter Greg Brown poetically describes as God’s reminder that creation is a good idea. Postscript: The thing about fishing is that it keeps on giving. A year after retirement I found myself spending a week fishing in the legendary Catskills with my fly angling buddy Dan Kennaley and his brother Martin. My Sweetgrass didn’t let me down as a I caught my biggest brownie ever on the Upper Beaverkill and a brookie on the Willowemoc among others.